This is a story of two people, Rick and Susan, who united to form a blended family of seven and went on to travel North America in a motorhome, fondly referred to as a Moho. We have been involved in several businesses and have had several occupations; from bartender, truck driver and small motor mechanic to dental assistant, sales persons and small business owners. When I started this on line journal, back in 2003, Rick (my hubby) and I were true gypsies; we had no agenda, no planned destinations and no roots keeping us in one place. Our intention when we hit the road on December 28, 2003 was to explore North America, see places we'd never been to and make friends along the way. The purpose of this site was to record our adventures and share them with our friends and family. We were often asked how we could afford to do this, had we won a lottery, were we independently wealthy, were we retired, just what was our secret? Our answer was always that we sold everything, we weren't retired and this was just a break from the world of business. We knew eventually we would have to get serious about life once again but we wanted to enjoy traveling while we were still physically able enough to do things. 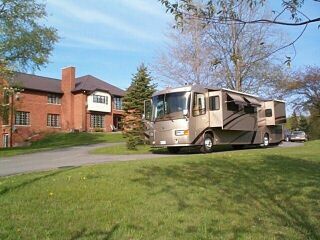 Fast forward to the autumn of 2007 and here we were preparing to go back to stix and brix; to give up traveling in a motorhome and to get back into the world of commerce. We have settled in the lower mainland of Vancouver, British Columbia where we are near two of our grandchildren and some of our children. We accomplished our goal of making new friends and seeing much of Canada and the United States though we left many places unseen perhaps saving them for future adventures...perhaps not. We have enjoyed 45 months of rambling along the roads of Canada and the United States and here you can read all about it. You'll find pictures and daily journal entries with information on fulltiming, campgrounds we have stayed in, our experiences and my opinions on life in general. More recently I have written about our re-entry into the labour force along with the excitement of changing our home and lives...once again. Throughout the site you will find links, which are underlined and “bolded”; just click on them to read about those topics. Aside from the almost daily photographs in the day to day entries, by clicking on the Flickr link on the left, you will find thousands more in chronological order. In "Our Journeys" I have tried to keep it organized, again chronologically, but also by location with the oldest entries last. If you are looking for something specific, try typing it into the site's search engine on the left or write to us for help or to share your comments. We LOVE to hear from you!